The following General Terms and Conditions (TERMS) constitute the regulatory framework for the services of United States Press Agency., hereinafter referred to as "USPA". The members, contract and business partners of United States Press Agency (USPA) are hereinafter referred to as "Members". USPA United States Press Agency is a registered trademark of the UPA United Press Association, Inc. Las Vegas, USA. The services and products of USPA are non-binding. Free offers and services that have been made available are subject to change and withdrawal without prior notice. USPA offers its members to become accredited by using their USPA status. A fee is charged for membership. Each member will be sent an advance payment invoice via email. 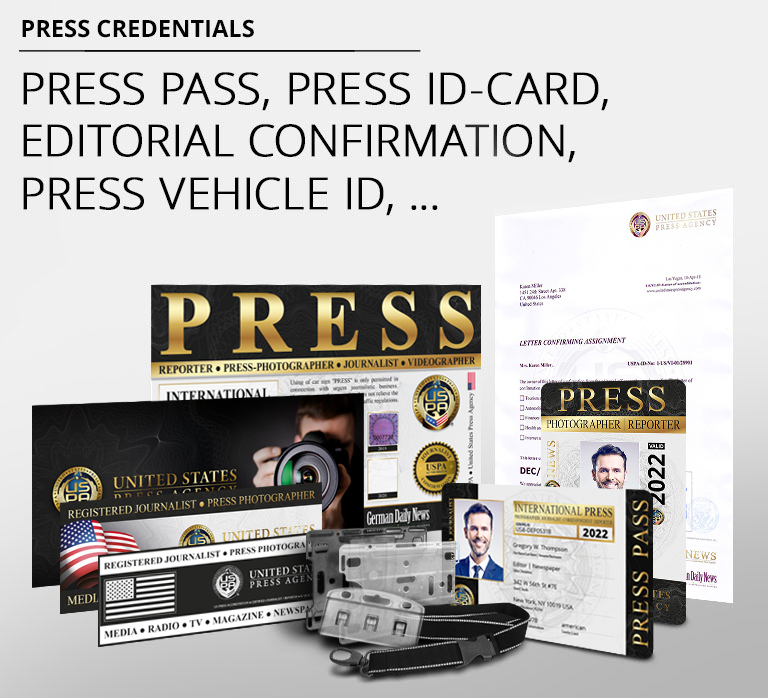 For their accreditation, members are provided with a number of press documents (press pass, press ID card, press press sign for your car, editorial confirmation, etc.) which they can use at their convenience. These press credentials are provided free of charge but remain the property of USPA. There exists no right to membership. USPA reserves the right to not accept membership. USPA cannot be held liable for costs incurred by the activities of the member. The member is expressly no representative or employee of USPA and is not permitted to pretend to towards third parties. The goods are delivered solely on the risk of the member. Upon the acceptance of the goods from the transportation company, the risk is transferred to the member. USPA is not liable for delays in shipping and delivery due to Acts of God. USPA can prolong the date of delivery in the amount of the duration of the delay. USPA is not liable for delays (for instance, caused by technical or server-based breakdowns). USPA has no influence on the delivery time of the country´s delivering authority, which may result in country-specific delivery times of between 7 and 18 days. USPA´s press credentials and merchandising items are shipped within 10 working days after the availability of all required data and receipt of payment. We ship to the Americas, Europe and other countries except the following: Indonesia, Iran, Iraq, Cuba, Liberia, Libya, Myanmar / Burma, Nauru, North Korea, Nigeria, the Philipines, Sierra Leone, Sudan and Syria. Free press card sets, that are shipped to new members, will only be delivered if the new member has provided a digital passport photograph, as can be referred to on our web site. We are not required to issue and ship a new press card set before being provided with such a passport photograph. The lack to provide this photograph deprives applicants of their right to full or partly reimbursement. Immediately after receipt of payment and confirmation of USPA membership, you will be accepted as an active USPA member. The confirmation by USPA requires the receipt of the member´s complete admission form and, if applicable, the examination of all necessary preconditions, which may involve the display of their name in the imprint of a relevant news medium or recent publications or royalty statements received by a relevant news medium. USPA reserves the right to demand further evidence about the existence of the member´s journalistic work as well as the right to ask for random samples at irregular intervals. The member is obliged to provide evidence of their journalistic work within 30 days. If the member does not oblige or does not provide proof of their journalistic work 18 months after registration and without prior request, they will have failed to meet the requirements for the issuing of press credentials and press ID cards. If your membership has not been confirmed, USPA will refund the membership fees paid in advance. Your new membership is valid from the date of confirmation by USPA and to December 31 of that year. (Because: Press passes will be issued on every January 1 for the year to come) Membership is not automatically renewed after the end of the year. Members will be annually notified by email in October to decide whether to renew their membership for another year and pay the annual membership fee $48 in advance. USPA reserves the right to refuse the renewal of membership without stating any reason. USPA reserves the right to change the renewal fee any time by making them available at www.unitedstatespressagency.com The data collected in association with a membership will be deleted 30 days after expiration of membership (usually on January 30). Members are obliged to observe the USPA ethics rules and press code for journalists. The Terms and Conditions outlined here must be observed. USPA reserves the right to make changes to the business terms and guidelines at its sole discretion. As a member, you accept that any changes to your USPA press documents, such as press pass, press ID card, editorial confirmation, etc., is considered a violation against USPA rules and a fraudulent act and also subject to criminal and civil-law prosecution. Non-compliance with these TERMS and / or guidelines may result in immediate termination of membership. Both press pass and press ID card is the property of USPA; you can use it for the duration of your accepted membership. a. Payment is possible by PayPal or Google Wallet here on they can pay by check, bank transfer or credit card. b. The delivery of the press credentials made immediately after receipt of the invoice amount to the account of the USPA. c. If any of you were to be rejected at the USPA payment, you agree to reimburse USPA all costs incurred by legal requirements (fees for returned cheques). USPA reserves the right to charge dunning charges, collection charges and fees for returned cheques money owed to USPA. If your membership is terminated because of unpaid fees, you agree to send all USPA press credentials to the USPA headquarters. In the event of a not authorized PayPal, Google Wallet or credit card chargeback issued by you, USPA reserves the right to dispute it. You agree to reimburse all chargebacks or fees incurred by not authorized or deliberate chargebacks to USPA. Our fees for chargebacks are between 20 USD and 100 USD. Payment Processor is UPA United Press Association, Inc. Las Vegas. The debit of your credit card is only considered a confirmation of your membership and the activation of your account and does not include expenses for the use of our press documents. The use of your press documents is a service included in your membership, however not in the paid membership fees. All press documents are the property of USPA and are available to you for the duration of your membership. If payment of membership fees is made by Google Wallet and via PayPal, you agree that the full amount is due after the activation of your USPA account. Membership can be terminated by the member up to 30 days before the end of the year. Upon the coming into force of the termination, the member is losing its right to use their press credentials. Claims as to the reimbursement of already paid fees or lump sums (such as fees for accreditations or annual certificates) will not be made. USPA denounces its right to termination, provided the member observes to the TERMS. If the member grossly violates against the TERMS, the membership status can be terminated without observing the period of notice, with the member losing their right to the refunding of payments and fees. After termination or expiration of membership, you must send all materials including the press pass set and other items showing the USPA logo to the USPA headquarters and bear the costs for shipping and packaging. Continued use of USPA press credentials or membership logo is considered a fraudulent act and subject to criminal and civil-law persecution. USPA press credentials are issued for one person only and will remain valid after the member has changed their journalistic work. Members are required to report changes in their place of residence to USPA along with their annual membership renewal. The member provides a digital passport photograph. If the photograph is sent by regular mail, USPA assumes its implementation. The member does not make use of their right to reclaim the photograph; USPA does neither store nor archive any of such photographs. Press credentials are only provided to members accredited by USPA. All pictures of the press credentials and merchandising items are examples only and may vary in color, shape or because of updates and improvements from those on display on our web site. Costs for a second issue due to loss or address changes may be retrieved from the membership Login area (USPA-Shop). Application forms must be filled out completely and truthfully; the member is responsible for entering the correct data. Applicants using wrong or misleading data will be restricted from membership and lose their right to using the press documents. The press credentials provided by USPA are only valid in connection with the USPA annual press sign for your car or the year-date shown on their press pass. Both press pass will be issued annually after receipt of payment. The member is required to stick the annual sticker (hologram) to their press sign for your car. The press sign for your car is valid only in connection with the press pass and may be annually renewed. The press sign for your car is issued for free at the first time and is valid up to 3 years. After this period, the member may request another sign. The member bears the costs for issuing and shipping the new press sign for your car. The press sign for your car does not discharge from driving in compliance with traffic regulations. If no payment for annual certificates and service fees has been made, USPA reserves the right to freeze the accreditation and membership account and collect the press credentials. You warrant that you will always meet your duties and obligations as a member. The data provided through your application form are accurate, complete and truthful. You are at least 18 years of age. You notify USPA as soon as possible about any changes to your data, including credit card data. USPA is not held liable for your expenses. USPA is not held liable for any costs members have incurred in the course of pursuing their obligations. The press credentials issued by USPA do not constitute shopping vouchers or valuable benefits. Press credentials must be sent back without prior request if the conditions for the right to use them are no longer valid. USPA reserves the right to make changes to the TERMS at any time. The member declares to be journalistically active. If the member is no longer journalistically active, they must immediately notify USPA. In this event, the member has no right to reimbursement. All trademarks and trade names on display on our web site are property of their respective owners and subject to these property rights of the registered owners. The mere naming of trademarks does not mean that they are not protected by property rights of third parties. Copyright for objects created and published by the service provider remains with the service provider. Any duplication or use of such texts and documents in other publications without the written consent of the service provider is not permitted. For any disputes between service provider and user, the law of the United States of America shall apply. For both parties, place of performance for services included in this contract is Las Vegas, as well as for disputes arising from the contract between USPA and its members. Responsible: UPA United Press Association, Inc.
USPA assumes no warranty for the permanent availability of its online shop and for damages or disadvantages arising from its use. USPA cannot be held liable for the loss, misuse or faking of data that have been electronically transmitted between USPA and its members if the data have not evidently been faked or misused by USPA. USPA reserves the right to exclude members from commercial transactions if they are connected to misuse of online services or electronic or non-cash payment methods or if there is justifiable suspicion. The conditions of the Privacy Protection Law apply. Data of members will be stored electronically. Private data of members, such as name, address, phone numbers or email addresses, will not be provided to third parties. Where users of the online shop are required to enter data, it should be noted that the entering of such data is carried out on a voluntary basis. As far as these TERMS hold no deviating regulations, then the statutory provisions are in effect. If any individual provisions of these TERMS or of the other agreements between the parties should be invalid as a whole or in part, this shall not affect the validity of the remaining provisions.